An Open Access and Science Publishing survey is currently being distributed. Take a few minutes to contribute your viewpoint. Can Open Source Science be too Open? Wouldn't it be great if we could find a way to make most of the scientific process public but at the same time guaranty some level of competition? What I think we could do would be to define steps in the process that we could say are independent, which can work as modules. Here I mean module in the sense of a black box with inputs and outputs that we wire together without caring too much on how the internals of the boxes work. Although I don't agree that it is necessary to hide real-time information to be a productive scientist, I am glad to see that people are having this conversation. And the beauty of current web technologies is that each scientist can set up their own black boxes as they see fit. We already see that with existing attempts - for example Nature Protocols discloses much more than a typical experimental section in an article, including troubleshooting tables. But we don't get to see the messy series of failed experiments that enabled those troubleshooting tables to be constructed. I was pleased to notice yesterday that, when editing a Wikispaces page in text mode, an option to embed media pops up on the right. This new feature does in fact allow introducing the script required for the counters like Sitemeter. 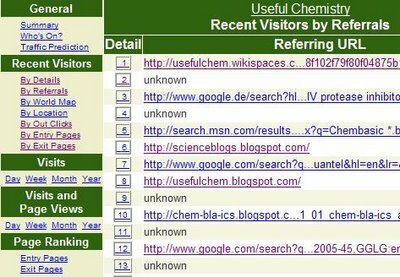 The versatility of the Sitemeter tracker is such that I can use the same counter for my UsefulChem blog and wiki and tell where visitors landed from the Entry Page view. And the Referrals View shows how they found the site, including keywords used in Google, for example. If you are using the Sitemeter code in your Blogger account, you will find it at the very end of your Template file. Note that you can't simply copy this one line to all your Wikispaces pages. You'll need to use the Embed Media box on every page you wish to track. All of this works with the free versions of Wikispaces and Sitemeter. I just came across Stevan Harnad's poem "Publish or Perish" on Christina's LIS Rant. work's not enough, you've got to make it pay. is not just publication but citation. the higher then is reckoned its just dues. the World Wide Web at last can make Science free. 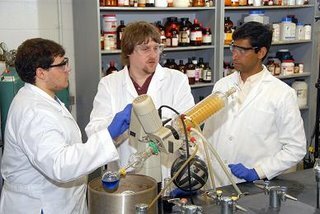 Chemical & Engineering News is running a story on Open Source Science, with an emphasis on chemistry related projects. UsefulChem got a nice mention. They also put a pic of me with my students James and Khalid. James is on the left next to the rotovap. Anyone familiar with our malaria research will wonder why there is a blue solution on the rotovap. The photographer wanted us to do something interesting and colorful so James made up a solution of methylene blue for effect. Trying to look serious talking about the blue solution gave everybody the giggles. Nature Protocols is a definite step forward toward open source science. 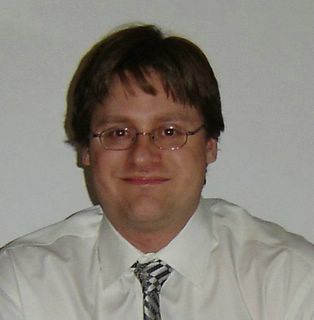 The protocols are peer-reviewed and open for comments. I really like the troubleshooting tables. Nature Protocols is an interactive online resource for laboratory protocols for bench researchers. Protocols are presented in a 'recipe' style providing step-by-step descriptions of procedures that users can take to the lab bench and immediately apply in their own research. Protocols on the site are fully searchable and organized into logical categories to be easily accessible to researchers. OOPS is the Opensource Opencourseware Prototype System involved in translating content from MIT's OpenCourseware. This thesis offers an unusually candid look into the politics and personalities involved in an open source volunteer-based organization. There are, however, a few thorns among the roses. Traditional publishers are often skeptical about the business models of their open-access rivals, and they sometimes have cause to be. The Public Library of Science (PLoS), an American organization regarded by many as the flagship of the open-access movement, lost almost $1m last year. As a result, it is about to increase its charge from $1,500 per article to as much as $2,500, depending on which of its journals an author publishes in. Since anyone can make their research available for free by self-archiving, presumably the added value is the "blessing of peer-review". But if reviewers are not paid, where does that money go? Anyone out there know? Thanks to Beth for the link. I just returned from doing a workshop at Lehigh Carbon County College (LCCC) and Lehigh Career and Technology Institute (LCTI) in the great Schnecksville, PA. There were about 50 attendees, mostly a mix of college and high school teachers. In the morning, Beth and I gave some general talks introducing RSS and some applications of blogs, wikis, podcasting, vodcasting and games in education. The attendees were very active in asking questions and I didn't get to finish my slides. That's actually a good sign that there was some real interest and knowledge transfer. In the afternoon the attendees split up and rotated between our workshops. Beth ran the one on blogging, Marc Bonanni did wikis and mine was on games. That was a lot of people to train in 2.5 hours and we were all exhausted afterwards. My objective was to have them learn to navigate one of the EduFrag mazes, create at least one bitmap door with Paint then import it into a room using the UnrealEditor (free version, no weapons). There were too many people for me to assist individually in that amount of time so after I trained the more tech savvy attendees I asked them to help the others. It was not possible to do it "lecture style" because people were rotating on their time. I think most attendees who were interested in creating games at least acquired an understanding of how the EduFrag system works to create their own content for their classes without much additional help. I also asked them to create true and false doors based on what they learned in the workshop. If I collect enough, I'll pool the best of these together in one common maze to teach educational web technologies. Beth discussed a problem in her talk that I ran into directly during my workshop: the blocking of blogs in PA high schools. I was unable to access the EduFrag blog to show the attendees how to download other maps. Luckily, for now, access to Wikispaces was unobstructed and the computers in the workshop room were pre-loaded with the educational version of Unreal Tournament with Beth's grammar and one of my chemistry mazes. Beth ran her workshop in LCCC, which is a college, and thus was not subject to the blog blocking. Overall the response was very positive and I look forward to following up on the implementation of some of these technologies. Here are the workshop blog and wiki. Here are the recordings of Beth's and my talk.